I purchased the Quilt Wizard software at JoAnns a few years ago when I had a 50% off coupon. I know it's made by the same folks who make the Electronic Quilt software. 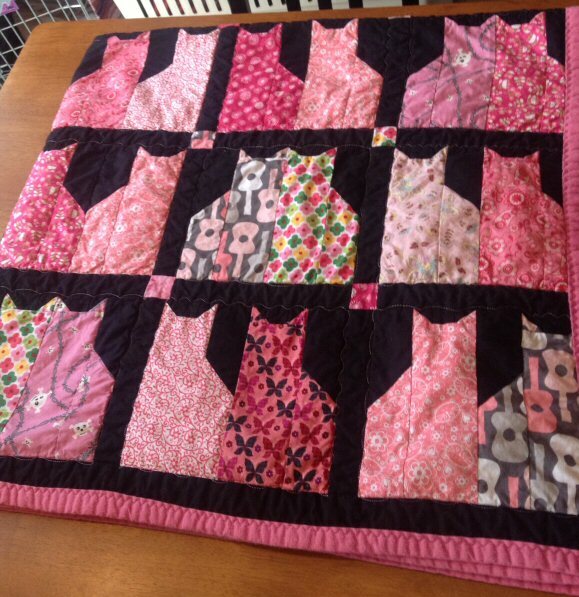 Here's my question...Are you able to truly create and design your own quilt blocks using the EQ software? The Quilt Wizard software is pretty easy to use, but quite limited in that you must choose from existing quilt blocks. There are so many simple blocks that are not included to be used. I want to be able to create blocks of different sizes that can be used in a single project. For example, I'd like to be able to maybe create a 16 patch block and use a solid block where I've snow-balled the corners as a sashing, along with a corner stone block where the vertical and horizontal sashing meets. QW is only capable of using all standard same size blocks. I'd like to be able to create a block and then repeat it as a unit in a design, as opposed to creating all of the individual pieces that make up a 16 or 20 inch block. Hope this makes sense. Before I jump in to purchasing one of the latest versions of EQ, I wanted to be sure that I'd be able to create the type of quilt blocks that I have explained. I have EQ7 and EQStitch, but just learning. 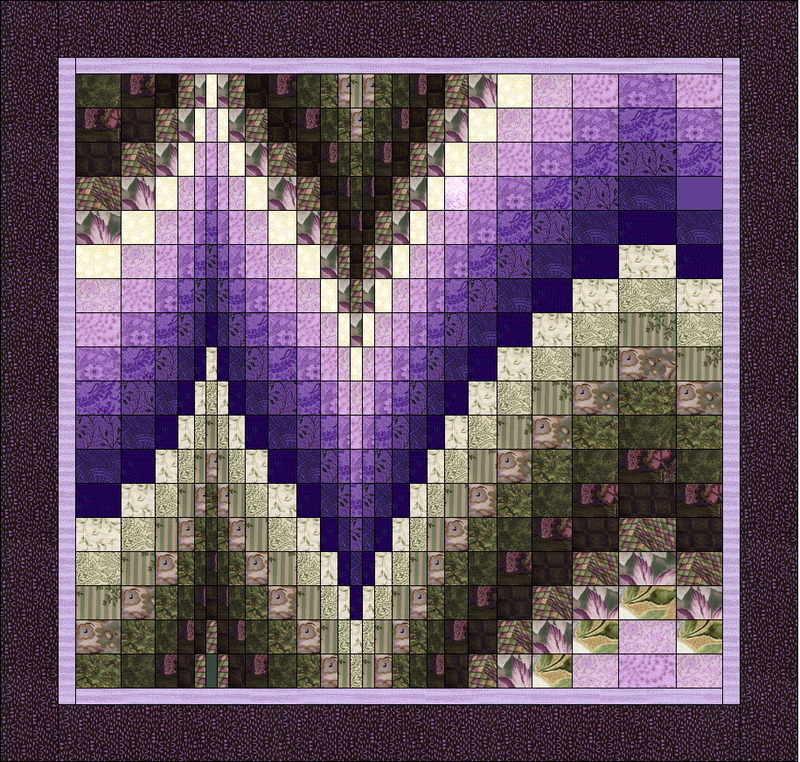 Have made many quilt designs of all sizes on EQ7. My recommendation is to go to Electric quilt website and check out videos and patterns made by designers on EQ. There are many on this board who are experienced in pattern design on EQ and I am sure they will give you more expert help. EQ7 will do everything you want -- it's extremely flexible and comprehensive -- but at a cost. That cost is a steep learning curve for the software. Some people seem to pick it up easily, but many of us struggle with that learning curve. I had the design wizard software and upgraded to EQ7 when it first came out. I can't say I've used it as much as I thought I would, but I also haven't taken the time to really learn how to use all the features either. There is definitely a lot more there in EQ7 than I know what to do with. Lots of times I just get impatient and whip out my trusty graph paper and don't mess with technology! Yes it will do just about anything that you want and yes it is pricey. The older versions do just about everything that EQ7 does but the one thing that is different from the older versions (EQ5 / EQ6) to EQ7 is that in the earlier versions you had limited installs (ie if you got a new computer - one install, if your HD failed - another install etc) where as in EQ7 you are limited to "active computers". It also has a learning curve. Lots to learn to use all the features. I am a retired HS Comp Sci teacher, and despite the fact that I use it weekly I am still learning. I use mine all the time - I NEVER make a quilt that does not morph as it is being constructed, even if I have a "pattern". I play with borders sashing etc on every quilt. I am also currently in a BOM that uses templates (I despise using templates) so I put the blocks in EQ and do Paper Piecing with them. If you are diligent, EQ also has monthly fabric downloads to add to your "fabric stash" in the program. Lots to play with - only you can determine if it is worth the price. Don't buy EQ5. The user interface was changed drastically when EQ6 came out, and it is much easier to use as well as having more features. And don't buy EQ6 because of the problems with multiple installations. If you want to be really happy with the purchase, get EQ7, and upgrade every time a new version comes out. EQ7 will do everything you are asking about, and much more. I use it for every quilt I make, and for many quilts that never get made. Even if I start with a pattern in a book, magazine, or online, I still put it in EQ7 and experiment with different fabrics, borders, settings, etc. I don't understand why so many people think EQ is an expensive tool. For what you get, it is very reasonably priced, much less than the cost of making even one quilt at today's prices. Look for a sale on the quilt in a day web site. I bought Quilt Wizard on sale at the same time as EQ7 and I never use it, because of its limitations. Now that's what I call an expensive piece of software - one that you paid for and then never use. EQ, on the other hand, was a bargain. I have EQ6 and I thought it was a nightmare to learn. I have extensive computer skills and use MS Publisher and Adobe Photoshop, etc., so I have used different graphic programs. There are many videos in the program to teach you how to use it, but I confess that I had to have someone sit with me and teach me how make a basic quilt. That being said, now that I have figured out the basics, I love using EQ6 and every quilt I have made recently, I draw into the program. I'm working on a Storm at Sea quilt now and I did it in the program and printed out the paper-piecing blocks. They printed perfectly to the correct size. The more I use it, the more I learn about it. It was just getting started that was frustrating me. If you decide to get the program, don't be afraid to ask for help. Don't let it sit on the shelf for months like I did. It really is fun to use. You can definitely design things on EQ7 but as others have said - there is definitely a learning curve. It is not nearly as intuitive as most other software is...things you think you should be able to do don't work the way you expect them to and it takes work to figure things out. BUT, having said that, I LOVE it and use it all the time. I subscribe to a lot of quilt magazines and buy lots of quilting books, and I have a lot of fun reproducing quilts that catch my eye in EQ7 and then I can play with colors, change borders...all sorts of magic! I also enjoy comparing photos of my finished quilts to my EQ7 versions and seeing how close they came out...sometimes very close! 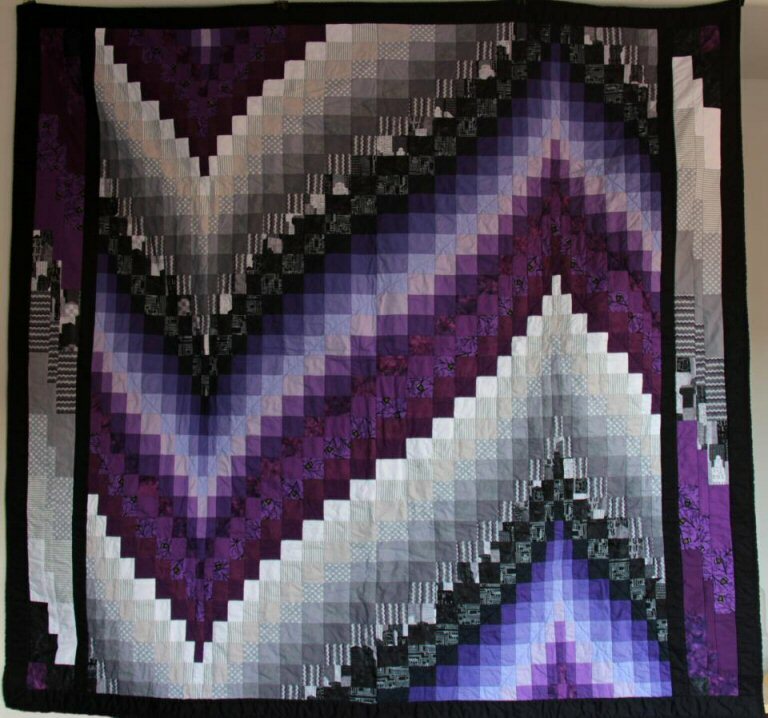 This one is based on "House Cats", from Quilts to Share by Janet Kime; I reproduced the block in EQ7 and then changed the colors up and I think the sashing was my own addition too but can't remember now. This one was super easy to make in EQ7. This one is my own design - bargellos aren't especially easy or quick on EQ7 (unless someone knows a trick?) but they CAN be done! To answer your question, yes you can design your own blocks. You can design your own applique. You can design pieced blocks with applique on them. You can design quilts with multiple-sized blocks in the same quilt. You can design quilts that aren't square, or use oddly-shaped blocks like hexagons or parallelograms. 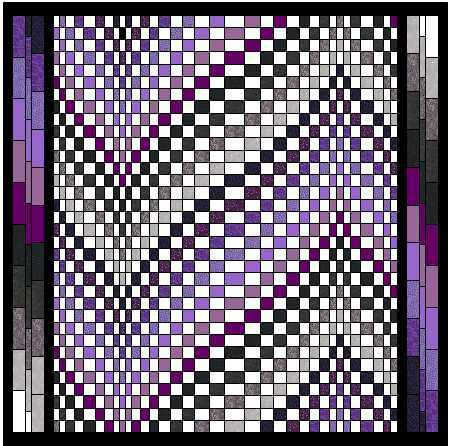 You can design quilts using pictures - for instance, you can import the picture into EQ and trace over it. You can design quilting designs and motifs to see how your quilt will look after it's been quilted. You can swap out colors and fabrics, and you can upload new fabrics into the program. 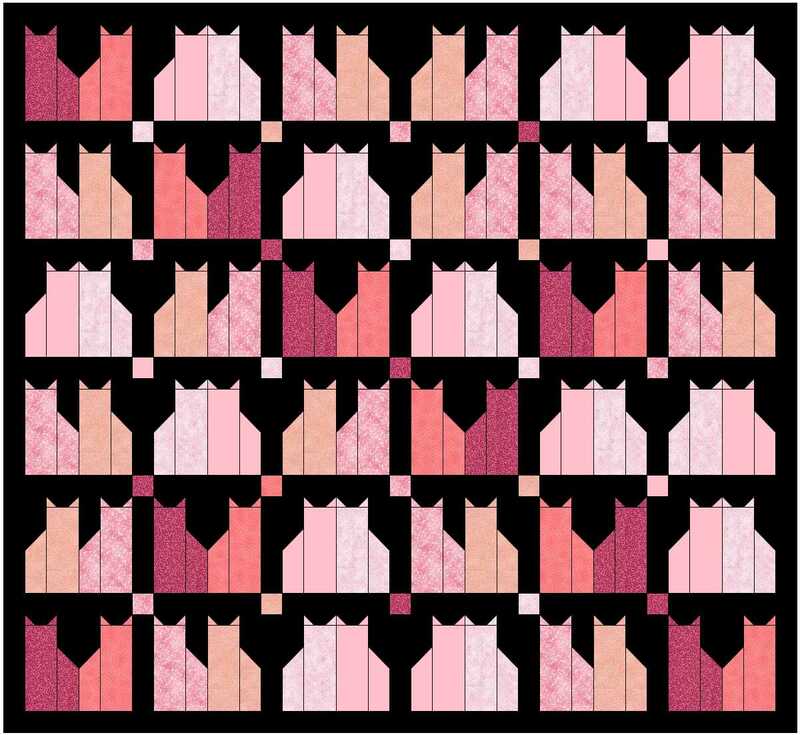 Most fabric manufacturers have free downloads of files containing pictures of their new fabrics, so all you have to do is download them into EQ. You can determine how much fabric you'll need for the quilt you want to make. I love EQ. I agree with Dunster, it is well worth the price for what I get and how much I use it. Historically, EQ has rewarded returning customers by not charging the full price when upgrading. I had EQ6 and when I upgraded to EQ7, I think I paid about half price. I did not find it hard to learn, either. There are video tutorials built into the software, and plenty of online tutorials and classes, but I didn't take any of them. I learned the whole thing on my own by just playing around with the software, looking things up in the manual, or if I was really stumped, I'd turn to the online EQ support forums, which are excellent. I started out with EQ3. EQ4 and I am currently on EQ5. You might want to check out their site to see what they recommend for what kind of operating system you are currently running on your computer. I am still running Windows XP and I have absolutely NO PROBLEM with designing blocks or quilts. These are hard times financially for some people and I can't afford to upgrade. I was disappointed that I am limited in the number of rows when I designed this Bargello quilt but I still was able to make it work. I have seen post here that Eleanor Burns occasionally has the software on sale much lower prices then anywhere else. Good Luck !! I've had EQ ever since it ran on DOS. It was over a $100 back then so the price now doesn't seem that shocking, in fact it's a bargain. EQ7 has the import and trace feature that I use the most. The other feature I use a lot is converting blocks into paper piecing. If you get EQ7, check online about classes being given at lqs or clubs. This might help. I wanted to take classes but all are about 100 miles from my little farm and timed wrong! I totally agree with Peckish. I only have EQ6 but it was relatively easy to learn and I have made friends with others who can help me if needed, esp when I am too lazy to wait and search for it myself. Several quilt camp type events have EQ classes. Though the online tutorials are great. Here is how you get more blocks into a Quilt Wizard design. I use a grid of small squares for the whole quilt. So, if I have a block that is 5 patches across and down and I need 6 of them in a row, the grid across would have 30 squares across, and down would be 7 blocks so it would be 35 squares, and make them in the proper size. In each square, I put the patch needed to make the block. So if I were to make a Sister's choice quilt block, then in the first square I would put my background color, in the second square, I would put an HST (from the block selection) and turn it the right way, then the next square would have a solid block of the fabric color, then the next an HST, turned as needed, then another background block, etc. So, the first row of patches needed to create the SC block, is actually made from the quilt block selection, just in miniature. SAVE AS YOU GO! If you want to make changes, but keep the original design, then change the name of the file before you save it after making the changes. Basically, I do the design by patches to create the block I want if it is not a choice in QW. When changing block sizes, such as a large star and then two smaller stars, you do the same thing, just use more squares for the bigger star. If the designed quilt is much bigger than you can get into the squared grid, then make 4 different grids, each one consisting of one fouth of the quilt, upper and lower left, and upper and lower right. Another thing you can do is to choose the right blocks needed, but color them to correctly match the quilt you want to design. Let's say it is a rail fence with 4 rails, but what you need is a block with TWO rectangles. Then you would use the 4 rail block and color the two rails on the left, one color, and the two rails on the right, the other color and it looks like a two patch block. My QW is on a PC that runs Win2000. It is offline now but I still use it for quilting and saving files for quilting patterns and information. Last edited by dmackey; 06-10-2013 at 12:12 AM.